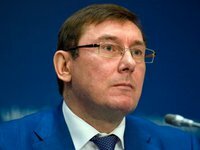 Ukraine's Prosecutor General Yuriy Lutsenko has said Batkivschyna Party member and Member of Parliament Valeriy Dubil is the organizer of an attempt at blackmail and bribe presidential candidate and Member of Parliament (People's Front Party faction) Yuriy Tymoshenko to quit the race. "Two suspects have been detained. Their talk about just being friends and that they wanted to lend the presidential candidate money … is not valid, because we have the statement from the presidential candidate himself and his assistant about blackmail and an offer of money, and we also have got an SMS message, which shows 'Valera BYT' ['BYT' stands for the Bloc of Yulia Tymoshenko] as a contact, whose telephone number belongs to MP Dubil. And we don't have the right to access it. We just know that this number is in many lists of contacts, including mine," Lutsenko said during a briefing in Kyiv on Thursday, demonstrating the exchange of messages between the two suspects who were arrested while trying to give Yuriy Tymoshenko a bribe. "This is the telephone number of Dubil, who is obviously behind the attempt to blackmail and bribe a presidential candidate," Lutsenko said.